Whenever we connect a USB Flash Drive on any external hard drive to our Windows computer, it is mounted and we are able to access it and carry out file operations on it. When we complete our work, to disconnect it, rather than directly pulling it out physically, it is recommended that we use the Safely Remove Hardware or Eject Drive option. This ensures that any incomplete file operations are completed and data corruption is avoided. Only after it is safe to disconnect the USB, should we physically remove the USB. But what if we feel the need to use the media again? We will have to connect it physically. And what if we have used the Eject Media option to dismount the media, but not physically unplugged it, and you now want to use the media again? You would normally physically remove the USB and after waiting for a few seconds, plug it back again. This is all fine if you are on a laptop, but it can get tedious if you are on a Desktop and your CPU is kept at an odd place or maybe under your table. In such cases physically unplugging it and plugging it back can become a tedious task. 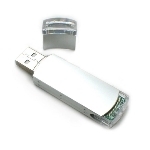 Unfortunately, Windows does not offer the function to let you easily remount the ejected USB Drive or media. But if you ever feel the need to remount the ejected USB Drive, without physically reconnecting it, follow this procedure. The Windows Club usb drive. permalink.